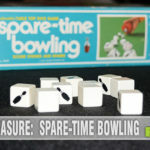 We’ve recently told you about one of our all-time favorite party games, Sequence, when we found its alter-ego, Sequence Dice at our local Goodwill. Here it is a month later and it is still a favorite with the kids, so when Jax (the makers of Sequence) offered to send us a couple additional games for our collection, we jumped at the chance. 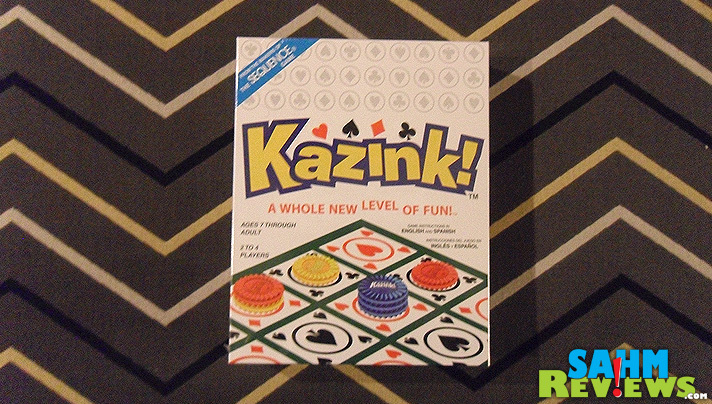 We were sure pleased to find one of the submissions was another flavor of Sequence entitled “Kazink!”. Kazink! takes the idea of Sequence to a whole new level (pun intended). It does away with the traditional playing card deck in favor of suited-only cards without any numbers. The object is still the same, create rows of colored chips in your color before your opponent. 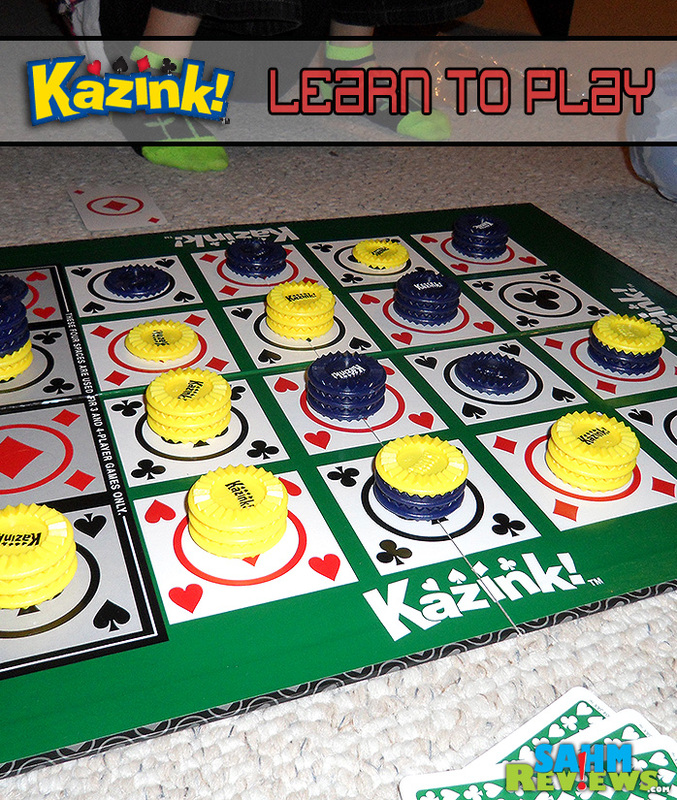 Designed for up to three players individually or more by combining into teams, Kazink! is almost a combination of Sequence and another Thrift Treasure favorite “Zenith“. 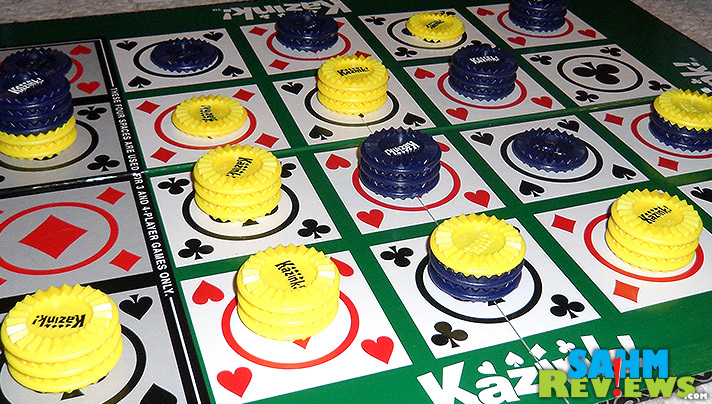 Each player is dealt three cards and takes turns playing a checker-like chip on the game board. The object is to capture (called “crowning”) a spot by getting three of your color stacked without interruption. Then you also try to crown adjacent spots attempting to line up three crowned spaces in a row. And if that isn’t enough for you, depending on the number of players you have to do this 2-3 times in total! All while preventing the other players from doing the same thing. It is Tic-Tac-Toe on steroids AND alien radiation! I know I’ve mentioned this before, but this is exactly the type of game our family loves. Very easy to learn with a simple ruleset and premise, but very hard to master thanks to many different possible strategies. All offense to beat your opponent quickly? All defense to block their every move before attacking? A combination of both? In the end, no matter the strategy there is always a winner. Let’s just hope yours are better sports than mine are! Many thanks again to Jax for providing us with a copy of Kazink! and allowing us to experience it for ourselves. If you can’t find a copy for yourself at a local retailer, be sure to check out the great pricing on Amazon, also usually under $20. I’ve never heard of either of those games, but they sound fun. My kids are still little, so we are still in the Operation, Candy Land and Chutes & Ladders mode in our house right now. I am going to check this game out! It looks like fun. I like how the rules are simple but that there are so many strategies to be explored to master the game. Lol, I love the pictures. I have never heard of or seen this game. Looks like so much fun! One my family is sure to enjoy when we start doing game nights. This is such a neat game! I love how it’s kind of like a combination between checkers and a card game. My son loves checkers, so he’d enjoy this. Now this truly sounds like a fun game. I’ve never heard of it, before today but I think my older son would love it! Never heard of this game, but it sounds like a new one. My family has always enjoyed playing board games. Oh I just love this! My kids and I love to play board games. This would be so much to play with my boys! I hadn’t heard of this game, but it sounds like a lot of fun. 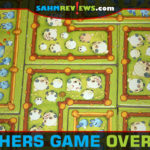 Our favorite game (or should I say my favorite board game because I have to force the kids to play it with me) is Sorry. I’ve never heard of this game. It looks like fun though. Now, this is creative! Might be fun for a family game night, too! I’ve never heard of either of the games, but they definitely sound quite simple to play. May have to check them out the next time we’re looking for something different to play. I have never heard of this game before but it looks like fun and something that my family might like. 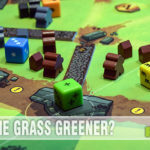 Board games really are a lot of fun and I think people tend to forget that in this day and age. We play a lot of games at our house. With one little kid and several bigger kids, it’s a challenge sometimes to play a game that everybody has fun with. Sequence is a great one, and I’m glad to see that they’ve branched out to more versions. Have you ever played Qwerkle? It’s a favorite at our house. I haven’t heard of this game before, but it sounds really interesting! 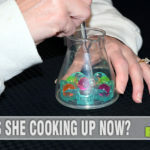 I think my husband would love it. These sound like a lot of fun. I bet my kids would really enjoy them! Looks like fun. I remember loving sequence when I was younger. We called it our summer game. 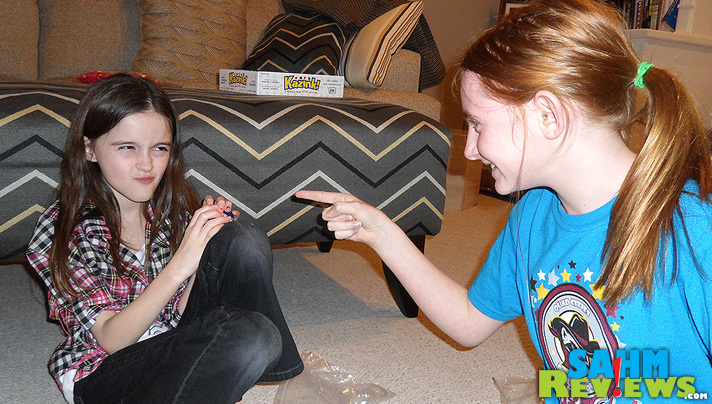 We love finding new games for family game night. This one looks like it would be fun, my youngest is sitting next to me and wants to play now. It will have to be a new addition at our house. That’s our favorite kind of game too, one that’s easy to learn but not so easy to master. This sounds like a really good one! A new game to try. The kids love board games and looking for new ones. I have never heard of this game! How fun!! I think my daughter and husband could get lost in this game for hours! looks like fun! I’ll have to keep it on the list for when my little ones are a little older! I love the girls’ faces! 🙂 We are always looking for new games to play! This looks like great fun!! So cute…I love the kid pics. This reminds me of checkers in some ways so fun. I’m a board game player through and through. This really looks like fun,and I love their expressions. This looks like a fun family game. I love simple games with easy directions! I like the sound of this game too. I love the look on the girls’ faces as they square off. It reminds me of when I used to play the card game Cheat with my sisters. I’ve never played Sequence before so this is an all-new game to me. 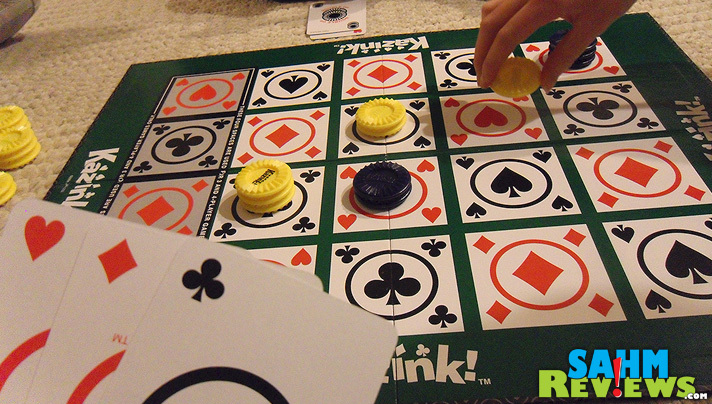 We love Family Game Nights and this looks like something the whole family can enjoy! I haven’t played this; but it looks like fun! 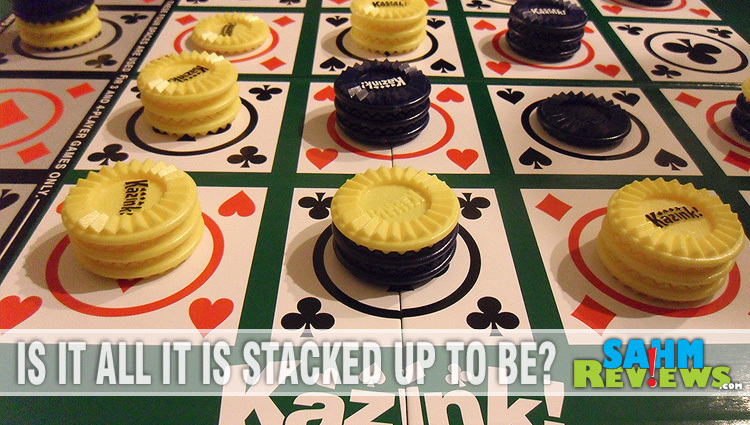 We love playing games as a family and this looks like a lot of fun!